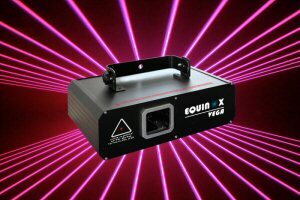 The Equinox Vega is an intense professional violet laser featuring multiple control options. The unit uses two diode pumped solid state lasers (dpss) to create a wide scanning effect that projects a multitude of animations, programmes and patterns that can be zoomed, rotated and expanded through the X, Y and Z axis with amazing results. The engine of the product is a 100mW violet diode seamlessly combined with a 200mW red diode to boost the output to an awesome 300mW. A mixture of static and dynamic patterns with ultra-smooth pattern transitions helps the Vega present itself in all it’s glory. Sound activation, auto run or DMX operation ensures it is an extremely versatile effect which is guaranteed to add the final touches to any lighting show. The Vega is housed in a compact, intelligently cooled casing and it’s club worthy performance is ideal for mobile light shows but is also orientated to complete any installed lighting display.